First of all let me state the obvious: hearing the name of J.K. Rowling you will immediately think ‘Harry Potter’ even if you haven’t read any of the books or haven’t seen the movies. But HP series was finished some time ago and now Ms Rowling decided to branch out. I am far from criticizing her for that, let me just say it was a very bold move, rejecting a genre which made you famous, renowned and super-rich, trying something entirely new and different. I grant it, she could afford that little experiment without breaking out into a financial sweat, a rare luxury among authors. My question is rather why it was done the way it was done when it could have been done almost any other way ? My first surprise: the new book was still published under the name of J.K. Rowling. Let’s face it – whether the author likes it or not that name belongs firmly to Harry Potter. Using it to market a contemporary fiction novel for adults is like trying to sell e.g. BMW shoes or Manolo Blahnik computers. Of course it has its short-term advantages: plenty of people have bought the book out of sheer curiosity (like me) or loyalty so I suppose the publisher and the author will make nice, fat profit, no problem. Still most of those casual readers will be confused and disenchanted at best, getting not exactly what they have expected or used to expect. I suppose next time they won’t fall for the magic name alone. The novel itself is a solid piece of writing, planned and executed decently well, but the topic isn’t either fresh or original, let alone ground-breaking. I am not an especially well-read person in English literature and even I have read many similar position by Kate Atkinson or Sue Townsend; I can even add Agatha Christie to the bunch here, and I must say their books were actually better – funnier, more edgy. 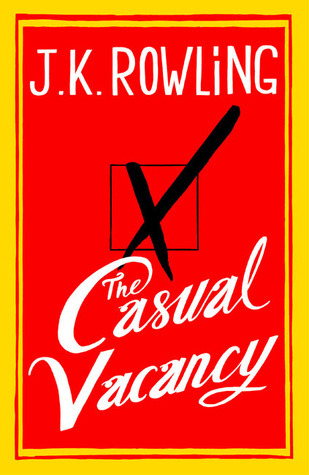 Do not expect in The Casual Vacancy any magic, even of the metaphorical kind, or fireworks of humour and wisdom. While reading it I didn’t feel that intense urge to find out what happened next, or to devour the book as soon as possible. It was a tepid story set in a banal, industrial-grey world; after reading it I could shrug my shoulders and move on. I related to none of the characters, I didn’t hate anybody in particular, I am not curious what will happen to them in the near future. If I have to be honest I could live without meeting them at all. I suppose I would be far more comfortable if the book was published under an alias. Now it seems to me that Ms Rowling decided to minimize any risk and to capitalize shamelessly on her previous success, selling readers something which is supposedly connected to the HP series but in reality as far away from those books as it can only be. Only after the lecture of reviews or the book itself you see you have been conned. Had this one been penned by a debut author, without all that glamour of a world-famous name, it would have still been published but I am sure it would have also passed unnoticed and would have been forgotten soon. A decent novel about contemporary Britain but nothing outstanding you must or should read or you miss out on an important book. Rowling has said pre-emptively: ‘ I’m a writer and I will write what I want to write.’ Ok, fine. I am a reader and I will read what I want to read. Not something like this one, though. This entry was posted in book review, contemporary and tagged J.K. Rowling. Bookmark the permalink.